Amy Campbell is a storyteller. Whether using a paintbrush or a microphone, she communicates the history of our region’s people and foods. 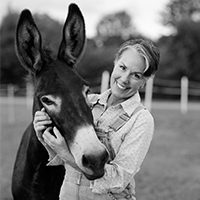 Amy is a Knoxville native, a professional portrait artist and a radio host. She created the podcast and radio show entitled "The Tennessee Farm Table" which airs weekly on 89.9 FM WDVX Radio station in Knoxville, Tennessee. The show airs every Saturday from 9:00 – 9:30 AM by radio and serves as a promotional vehicle for the people in our region who produce, preserve and prepare our regional foods. Amy is a former PR Representative for the City of Knoxville with the Knoxville Farmers' Market, a founding board member of the Maryville Farmers' Market, Market Manager for the Maryville Farmers' Market in it's 1st year, an avid gardener and seed saver. Amy holds a BFA from the Savannah College of Art and Design, and an MFA in Graphic Design from UTK. Amy is a former professor of Art from Maryville College; she is heavily invested in her community, has served on numerous boards, and seeks to help others make community connections. Amy has volunteered with WDVX Radio for over 20 years. since before it’s inception. Her art can be viewed in public and private collections including: First Tennessee Bank, Memphis, The Loyal Jones Appalachian Center, Berea, Kentucky, the City of Maryville, and in the homes of Dolly Parton, Jim Clayton, Natalie and Jim Haslem, Lamar Alexander, and Senator Jimmy Duncan. Amy and her husband enjoy a rural lifestyle along with 2 donkeys and 1 really fat orange cat. They enjoy growing food, flowers and mow enormous amounts of grass on 5 acres in Blount County, Tennessee. More information on Amy’s Art, Podcast and Broadcast: www.TennesseeFarmTable.com.